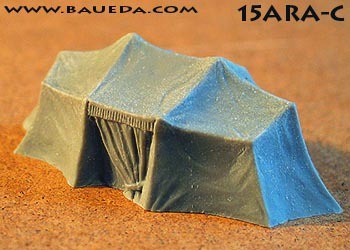 15mm Desert Nomads Tents AVAILABLE NOW! The basic element of the Bedouin's tent was a long, narrow strip of heavy cloth woven from black (or brown) goat's hair or sheep's wool (not, as many believe, from camel's hair). 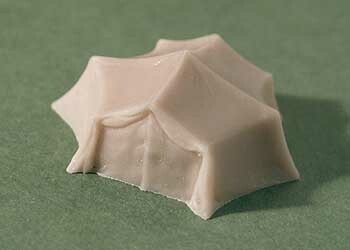 Several broad strips of cloth were sewn together to form a great rectangle, which became the roof of the tent, supported by poles. 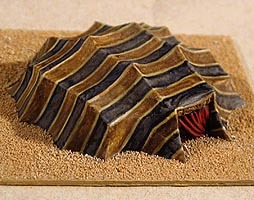 Another long narrow strip, the ruaq, was pinned to three sides of the roof of the tent by a series of six-inch wooden pins, then draped to the surface of the ground, where the lower edge was buried in the sand or, if the ground was hard, pegged down. The open side, which always faced away from the wind, was further divided by a number of qata, vertical curtains of intricate design which separated the various sections of the tent. Support for the heavy tent came from long hemp ropes, two affixed to each pole, and three at each side of the tent. The rope-ends were pegged to the ground if the earth was sufficiently hard; otherwise they were tied to large clumps of brushwood and buried two feet beneath the surface of the sand, bracing the tent as firmly as a ship's anchor. When a Bedouin family moved, the tent was dismantled, rolled up and put on male pack camels. In hot weather the ruaq shielding the sides were rolled up to allow the free circulation of air without admitting sunlight. 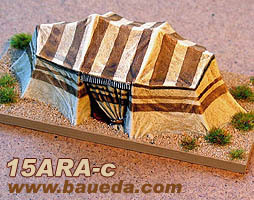 In cold weather (temperatures on winter nights in some parts of the desert can drop below freezing) the long qata were drawn across the open end of the tent, completely enclosing it, so that the fire kept the occupants cosily warm. 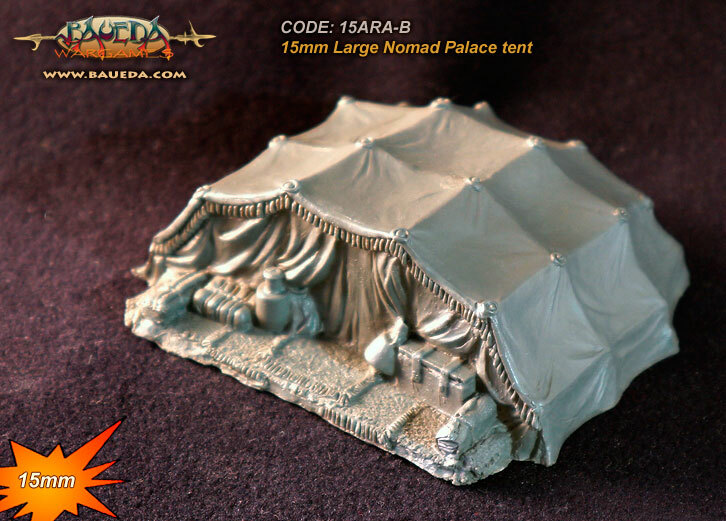 This tent is designed to be used as a baggage element for any arab nomad army, the model is about 45mm wide, 33mm deep and 17mm tall and fits on a standard 40x40mm DBM baggage base. 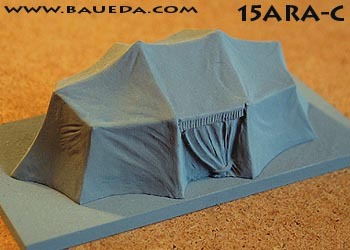 15ARA is available in three finish: simple plain cast, as it comes out of the mold; cleaned and primed, based and ready to paint; or as a finished DBM baggage element, painted, based and flocked to the very same standard you see in the picture! 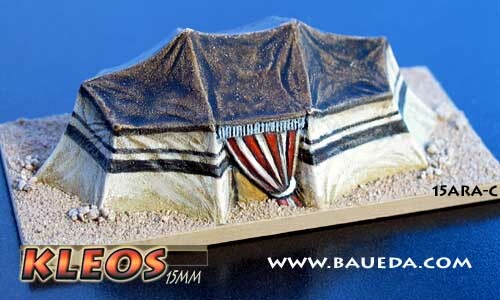 This large tent could be the accomodation of a king or the field headquarter of the army. It can be used by any Arab nomad or Persian armies, and can also be used for several Central Asian armies. 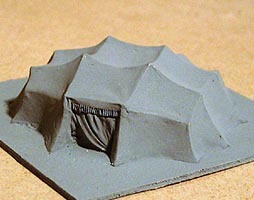 The model is about 73mm wide, 73mm deep and 28mm tall and will fit on a 80x80mm base (Four DBM 15mm baggage). We regret we are unable to offer this item as a stock finished element, painted and based. However we may occasionally offer some painted and based sample as promotion on e-bay; just let us know if you want to receive a short note when this happens! Painted sample on the way! 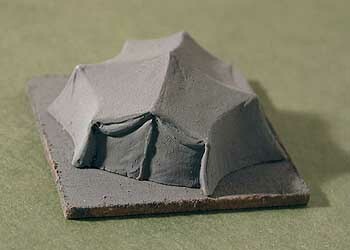 This large tent is another of the most common types of "black tent". 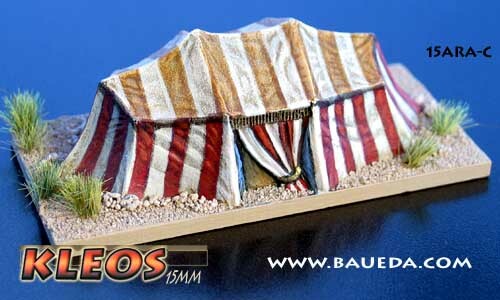 It is taller than the other nomadic tents in our range and is therefore more suitable for the larger 15mm figures, also referred to as "18mm". 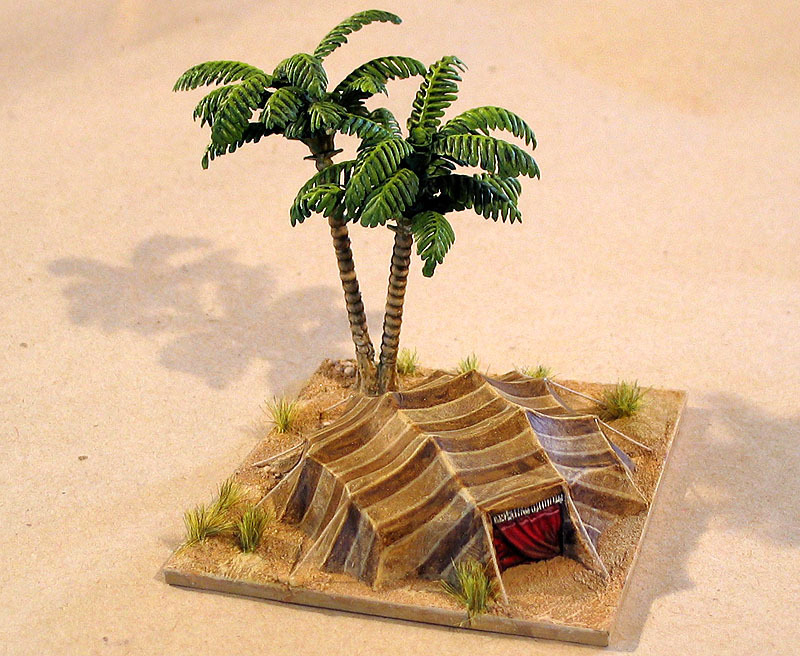 It has been primarily designed for Saracen and Bedouin armies, but can equally be used for any Arab, Hebrew, Central Asian, Middle Eastern or North African nomad army. 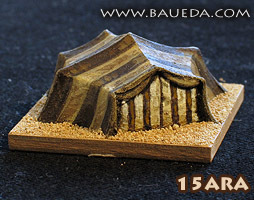 The model is about 72mm wide, 40mm deep and 25mm tall and will fit on a 40x80mm base (Two DBM 15mm baggage). 15ARA-c is available in two finish: simple plain cast, as it comes out of the mold; or cleaned, based and primed, ready to paint. We regret we are unable to offer this item as a stock finished element, painted and based. However we may occasionally offer some painted and based sample as promotion on e-bay; just let us know if you want to receive a short note when this happens. 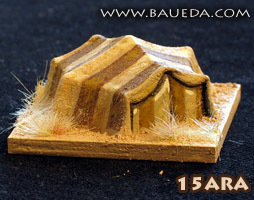 OLD Code: 15ARA-bThis model has been DISCONTINUED! A new one has replaced it!